Top Rank's CEO Bob Arum is planning to do a big homecoming card Michael Conlan “in the first six months” of 2018. He wants that card to be televised on ESPN as part of Top Rank's new deal with the network. The two-time Olympian is now 3-0 - fighting in New York, Chicago and Brisbane. He is set to return on September 22 in Arizona, when he fights on the undercard of the Oscar Valdez/Gilberto Ramirez world title doubleheader. Arum has a strategy with Conlan. He believes the Olympian can become a massive star, which is why the veteran promoter has been scheduling his fights in different boxing markets. "I was involved in fights for Barry McGuigan many years ago, and we brought fighters over to Belfast to fight during The Troubles, and we had him fight in Vegas. I realise what a figure Barry was at the time, and we feel that Conlan could even be bigger in this time," Arum told The42. “There are Irishmen all over the world, not only in Ireland but in England, in the United States, in Australia – that’s why we brought him to Australia. The idea is to keep him active, so his next scheduled fight, we want to expose him to different audiences, different ethnic groups, different people, which you can do in this country. So he’s going to fight in Tuscan, Arizona, which is a heavily Hispanic town. "There’ll be two title fights on the card: Oscar Valdez defending his title in one of them, and Gilberto Ramirez defending his title in the other. Two Mexicans, and we’re plopping Michael right in there, because I think the Mexicans will take to him the same way they took to Manny Pacquiao." The big plan for Conlan in 2018, is to bring him to Belfast or Dublin in the first six months - and televise the fight on ESPN. 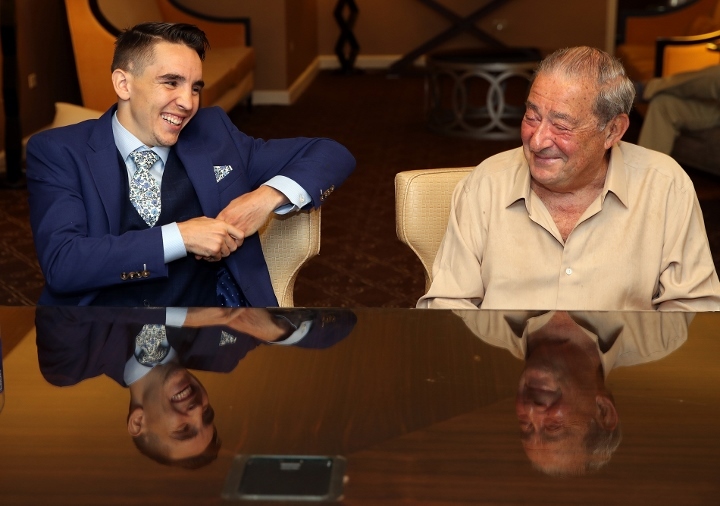 While Conlan's contract called for a fight in Ireland by the end of 2017, Arum believes the timing would be wrong and he wants to do it right and maximize the exposure for the card. “We want to definitely do a fight in Ireland for him, but we want to do it right, and we want to do it where we get the biggest possible audience in the United States. Therefore, we’ll have to do it outside of the American football season, because those games are played in the afternoon over here – whether it’s a Saturday or Sunday – so that’s no good," Arum said. [QUOTE=Vegemil;17959218]Conlan has a bigger mouth and much more noticeable power. People like that. [/QUOTE] I'm not arguing that. I just thought he would generate more interest as an Olympian. Who do you think wins when they fight? [QUOTE=THEFRESHBRAWLER;17959210]Dang wasup with Shakur Stevenson. He has absolutely no buzz rite now. He'll be still unknown in the next 5 yrs[/QUOTE] Conlan has a bigger mouth and much more noticeable power. People like that.